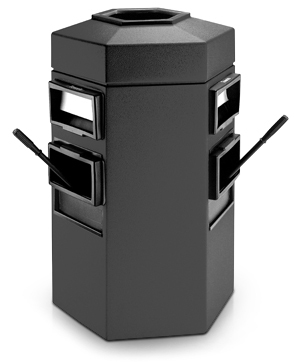 The Bermuda 2 is an environmentally friendly dual purpose trash receptacle with windshield service stations on both sides to accommodate two pumps without taking up extra space. Cleans up easily using standard cleaner. The standard towel dispensers accommodate 1 or 2-ply folded paper towels, suggested towel size is 10" x 10". Interior Splash Guards protect the towels from trash. The water buckets are removable and hold up to 2 gallons of water each. The long-lasting 1/8" thick polyethylene plastic won't rust dent or chip. Optional bolt down hardware can be used to secure the receptacle in place. This receptacle is made from 25% post consumer recycled (PCR) material. All models are shipped in a carton made from 50% recycled content. One Removable Water Bucket per Side. One Towel Dispenser per Side.